Apple’s (NASDAQ:AAPL) stock is up over $3 today, pushing it past the $230-a-share mark. Microsoft’s (NASDAQ:MSFT) is down $0.25, pushing it below the $30-a-share mark. While this discrepancy is huge on the surface, it doesn’t mean all that much because there are many, many more outstanding shares of Microsoft stock out there on the market (ten times more, in fact). That’s why Microsoft’s market cap is higher than Apple’s, despite the individual stock price difference. But that market cap gap is closing. Quickly. Apple looks poised to get within $50 billion of Microsoft market cap any day now. Currently, Apple’s market cap is $208.76 billion, while Microsoft’s is $261.01 billion. And while $50 billion may seem like a huge chasm, consider that since December 31, 2009, just a few months ago, Apple has added about $20 billion to its market cap, while Microsoft has lost about $10 billion. Again, the gap is closing, quickly. Things are even more insane when you look at the data from a decade ago. Back then, Microsoft’s market cap was nearly $590 billion. It was the most valuable company in the world — by far (#2, GE (NYSE:GE), was over $100 billion behind). Apple, meanwhile, had a market cap of just $16 billion at the time. It was the 339th most valuable company in the world, two spots behind Volkswagen (OTCPK:VLKAF). Those were, of course, different times. Aside from that 2000 spike, Microsoft’s stock and value has remained largely stagnant. For example, in 1999, its market cap was $271 billion — $10 billion more than it is today. Apple, meanwhile, didn’t make the list that year. But with a stock price around $10 at that time, it was likely worth around $5 billion. But that’s the point. Aside from a dip during the stock market collapse at the end of 2008, Apple stock has been skyrocketing. In the past 10 years, it’s up over 500%. In that same time frame, Microsoft’s stock is down nearly 50% (again from those early 2000 numbers). Apple has soared past HP (NYSE:HPQ), Oracle (NYSE:ORCL), IBM (NYSE:IBM), and most recently, Google (NASDAQ:GOOG), to move into the top five most valuable companies in the U.S.
And again, that’s at a stock price of $230. And that’s before the iPad has even launched. Certainly, you could argue that if the device isn’t a complete blow-out hit, the stock will take a hit (and probably a fairly big one). But if it is a hit (and early pre-sales numbers suggest it may well be), the stock has just as good of a chance to soar further. In fact, several financial analysts are already upping the sales price target into the stratosphere. Credit Suisse, for example, set it to $300 today. Now, I’m generally wary of anything coming from analysts, but let’s just say Apple did hit $300-a-share. Remember, their performance the past few quarters has been stellar, and there is no reason to think that will stop, even without considering the iPad. So at $300-a-share, assuming the number of shares remains fairly constant, Apple would be worth $270 billion. Yes, ahead of Microsoft (assuming their market cap remains the same over that time). If that happens (and again, I venture to say it will happen), Apple fanboys will go through the roof. Never mind that last quarter, Microsoft still made more revenue than Apple ($19 billion versus $15 billion) and posted almost exactly double the profit ($6.6 billion versus $3.3 billion — though, thanks in large part to early Windows 7 sales). The perception is that Apple has been hitting home runs the past several years, while Microsoft has been largely stagnant with some big strikeouts (Vista). To mix in another sports analogy, Apple, it seems, simply picked the right time to back the right horse: mobile. As executives have been saying recently, Apple now considers itself a mobile devices company, because most of their money comes from there (they include laptops in that category). Microsoft, meanwhile, is just about the furthest thing from a mobile devices company. The only device they make themselves is the Zune, and their mobile software, Windows Mobile, well, really dropped the ball the past decade. They’re now trying to capture some of that Apple mobile magic with Windows Phone 7 Series, and projects like the Pink phone and the Courier. Here’s the real problem for Microsoft, though. If Apple does in fact pass Microsoft in market cap, I can see CEO Steve Ballmer losing it, and that could steal his focus away from what should still be considered his real enemy: Google. It is Google, after all, that is directly attacking the core Microsoft brands, Office and Windows, where the company makes practically all of its money. Google Apps and Chrome OS are meant to do two things: Kill Office and kill Windows. 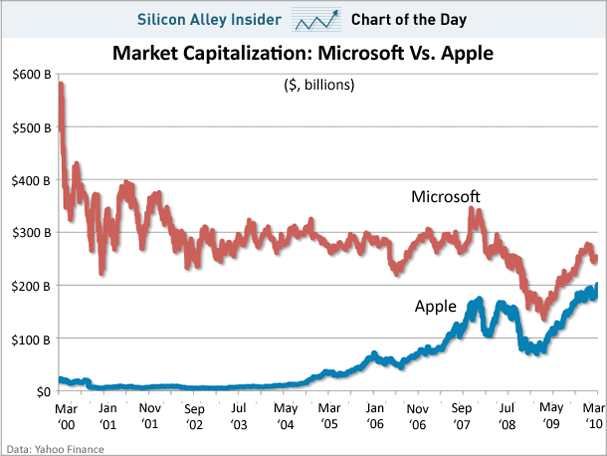 But I’m worried such rational thinking will go out the window if Apple passes Microsoft in market cap. And internal bickering at Microsoft will stop them from gaining focus. Or, rather, when Apple passes Microsoft in market cap.